« What is a Hand Impact Driver? Hitachi’s micro is one of the most powerful in its class. At 930 in-lbs of torque it out performs Milwaukee’s M12 driver, while its compact size puts it ahead of nearly everyone else. If you need a light to medium duty driver for everyday tasks, Hitachi’s lifetime guarantee has you covered. At only 2 pounds, and only 5.5″ long, the WH10DL impact driver is a very compact driver. Covered in Hitachi’s unmistakable bright green body, it’s easy to look at it and think it’s no more than a toy. With 930 in-lbs of torque, this little impact driver was surprisingly powerful. Even without pilot holes, long screws – 2″ to 4″ – are no problem. The impact action is consistent, keeping the driver bit seated in the screw without a lot of force. Even driving into tough wood, there is no need to push down hard as with a drill – the impacts do all the work, and don’t strip the screw. Note that while it can easily drive the long screws, it is not a heavy duty driver. Working with 3″ and larger fasteners will drain the battery much faster. That being said, there are reports of people driving hundreds of short roofing screws into metal roofs on a single charge. The grip is wrapped with elastomer, which is reported to be a tough and hold up over time, and it is surprisingly comfortable despite its small size. The 1/4″ chuck is the standard quick-change chuck most of the drivers have – pull the sleeve out, insert or remove the bit. One caveat with this one is that the small, 1″ driver bits don’t stay in as well. This unfortunately means you will loose some of the benefit of its compact size by having to use the larger bits. The variable speed trigger allows for control of the speed/torque you apply to the fastener. Like most others, the low end of the speeds are tougher to attain. The Hitachi lithium ion batteries are fairly long lasting – certainly much better than the NiCads. The WH10DL comes with two HXP 1.5 Ah batteries that are extremely light. The small size does mean they will run out faster than some of the larger 3.0 Ah batteries out there, however if you are staying away from the toughest jobs (like 4″ screws) it should last you quite awhile. All Hitachi HXP batteries include over-current protection to prevent overheating, as well as Hitachi’s 2 year warranty. The batteries additionally have a low-charge indicator led to let you know when it’s time to recharge. The ‘quick charge’ can recharge the batteries in 40 minutes. LED Ring around the chuck turns on with you pull the trigger. The ring helps eliminate shadows on your work. No belt clip included. On the other hand, it’s so small you can probably put it in a big pocket. Not a heavy-use tool. This isn’t really a problem as long as you know what you need. 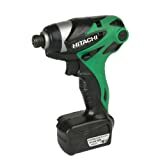 If you want a cordless impact driver but don’t need to build decks all day long, the Hitachi WH10DL will do the trick. Light and compact, you can get into tight areas or reach overhead with ease. With a great warranty, homeowners and professionals – especially those in HVAC, plumbing, or electrician trades – should make good use out of it for years. This entry was posted in 10.8v / 12v, Hitachi and tagged 12 volt, li-ion. Bookmark the permalink. Both comments and trackbacks are currently closed.